The following reflections are a compilation of reflections by Bethany Hill and myself. When you think about it, teams are actually everywhere. And I’m not necessarily referring to the typical sports teams that dominate the American consciousness when the concept of a team is discussed. A family unit thrives as a team. Service, church, and civic organizations touch thousands of lives as teams. Musicians who play and perform together do so as a team. Aside from the Lone Ranger (who interestingly had a trusty steed that he depended on), the majority of the world’s work force function in teams. They are all around us at all times, but sometimes difficult to see because they are often so close in sight. Think of the phrase “Can’t see the forest for the trees”. Team dynamics are a very interesting thing because every member brings something unique to the table. 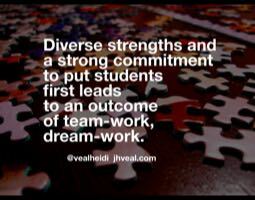 On high functioning teams, diverse strengths and a strong commitment to put students first often leads to an outcome of team-work, dream-work. Over the years, I have had the personal joy of working on multiple highly functioning and collaborative teams. There was much sharing and encouragement for professional growth. We studied student data together to identify our students’ needs and worked cohesively to design engaging units of study. We were empowered by leaders that allowed teammates to lead with their strengths. During my years as an educator I also worked on teams and have observed teams from the outside looking in that wrestled with dysfunction. It threatened to barricade the team from accomplishing their goals. These teams function more-or-less as a group of individuals who work next to each other and often uncomfortably bump into each other rather than cohesively pursuing a goal with excellence. Kind of like kids can sometimes do in a sandbox, you get the idea. This reminds me of Roland Barth’s metaphor of collegiality comparing sandboxes and beehives in his book Improving Schools from Within. 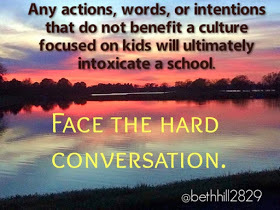 Linked here is a great article written by Barth for ASCD titled Improving Relationships Within the Schoolhouse for more on the topic. Recently, the John Maxwell Team shared several honest truths during a Twitter #LeadUpChat about the way teams function and work together. Bethany and I were equally inspired by their truths that day! Our hope is that, like us, you are also inspired by Maxwell’s wisdom to build teams that collaborate at the highest levels in spite of the inevitable challenges that arise. The first is this, “The team cannot continually cover up its weakness.” The team has to honestly face up to weaknesses that exist. No excuses, no matter what! Own the weakness and see it as a grand opportunity to innovate. If the team is always glossing over weaknesses it will never get better. Don’t be the team with their head buried in the sand! Confront weakness respectfully and in a timely way. When you consider this wisdom in the context of schools, the stakes are incredibly high, and I’m not referring to mandated high stakes testing! I’m talking about the education of our nation’s most precious resource, our children. The next truth John Maxwell Team shared was this, “When the team you have doesn’t match up to the team of your dreams there are two choices: give up your dream or grow up your team.” Only two choices exist here because doing mediocre work is NOT an option. That actually falls in the category of “give up your dream”. When the team settles for less than collaborative, supportive, collegial functioning, that’s a give up! Educators, we chose to pursue this noble profession in response to following a personal dream. None of us are willing to give up our dream of impacting our world by educating the next generation therefore growth is our only option! Team growing can come in many forms such as spending social time together to forge trusting relationships, spurring one another on in professional growth, welcome colleagues into your classroom to coach and give you feedback, using protocols to facilitate cohesive team communication, examining student data and flexibly sharing students across classrooms, and so on… What would you add? What have you tried? All teams must have a variety of personalities and strengths in order to function properly. There will be people who are somewhat hesitant of the team vision, and that is perfectly normal. We need these people in order to challenge our action plan and to become more grounded in our goals/beliefs. When the hesitance turns to resistance, we begin to lose ground toward the common goal and vision. Negativity, including resistance to change, disrespect toward others, gossip, etc., can intoxicate a culture. Leaders must face these issues head on without hesitation in order to preserve the health of the organization. The more negative conditions become, the more difficult it becomes to keep the trust and respect of the people impacted by them. When problems within are addressed, the people feel protected. Teams are stronger when leaders have the hard conversations. This forces the naysayers to jump on the bus, or find new one! Connections with people support our ability to have hard conversations, thus making our efforts to move the group forward more seamless. In John Maxwell’s book Everyone Communicates, Few Connect, he states, “Connecting increases your influence in every situation.” This cannot be more true! Our ability to connect is directly related to our ability to influence others. Our last truth from the John Maxwell Team is, in my opinion, the most difficult and profound. The strength of the team is impacted by its weakest link. *Why is this person a weak link? *Does this person KNOW he/she is a weak link? *Where do I desire this person to be? *Where does this person desire to be? *What are this person’s strengths, and how can I use them to coach him/her? We can look the other way, or we can face the weak links, assess the situation, and establish an action plan for support. The goal is to coach the weak links, leading the UP to improvement and growth. The alternative is to coach them OUT and on to a new path better suited for them. I believe strongly in the ability to lead UP. We can use or ability to connect to influence in a positive way. It all begins with our relationships with the people around us. Strong and lasting relationships foster the ability to lead UP, and allow others to grow into leaders themselves. In summary, we must remember the impact we have as leaders. Through a fearless nature, a strong vision, and the ability to connect, we can influence in ways we never imagined. It comes down to knowing people and appreciating where they are in their own development. When we establish that, we can face the hard conversations that will help us all reach a common vision. After all, #KidsDeserveIt!